CJ Perry is the exclusive distributor of Dmeco Sound Proofing Enclosures for Australia, New Zealand and the South Pacific. Dmeco is a World Industrial Leader in manufacturing custom designed canopy solutions for any environment. Canopy enclosures to meet the harshest environments from 60 degrees temperatures in the Middle East to corrosive salt spray conditions on the Coast of Africa. Sound Attenuated Enclosures of European design, suitable for a wide range of Generating Sets or Engine Drive Pump applications. 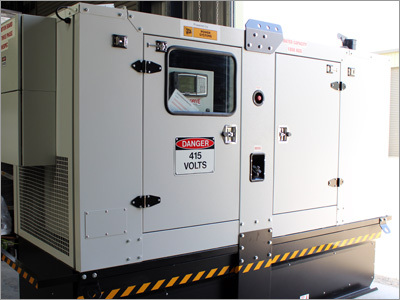 CJ Perry manufacture diesel generators and pump sets with acoustic canopies. The units are manufactured to stringent quality standards. We supply through-out Australia through our network of dealers. Product Bases are of rigid construction, reinforced by supporting cross bars and fitted with fluid collection basins. Adjustable supports with integral fuel tanks are included. Each panel is manufactured from powder-coated, galvanized steel. Panels are bolted to the frame base and incorporate lifting hooks. Sound proofing is fire resistant polyester.